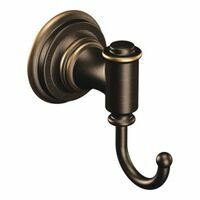 Mintcraft Garment Robe Hook, Series: Manhattan Collection, Double Robe, Chrome Mintcraft Garment Robe Hook, Double Robe, Venetian Bronze, For Kitchens, Bathrooms and Bedrooms- Aprons, Robes and More Chrome-plated. 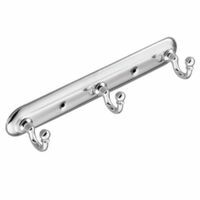 Ideal for bedroom and bedroom closets for purses, scarves, clothes, jackets, towels and more. 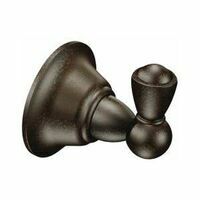 Fits over top of any standard-thickness interior door. 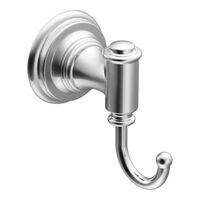 Donner Robe Hook, Series: Aspen, Modern, 2.186 in Diameter, 30 lb, 1-3/4 in Projection, 1 Hooks, Wall, Concealed Screw Mounting, Die Cast Zinc, Polished Chrome, Includes: Template and Mounting Hardware, For Living Bath Accessories Ideal for hanging clothes or towels. Fits the top of most standard household doors. 20"W x 11-3/8"H x 3'D. Made of zinc alloy. Boxed. Chrome finish is highly reflective for a mirror-like look that works with any decorating style. 3.06" L x 3.29" W x 2.50" H. View box package. 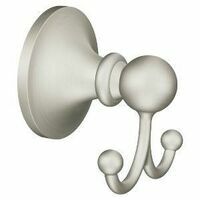 Brushed nickel finish robe hook brings the warm look of stainless to your bath. 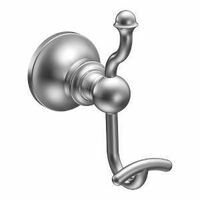 3.06" L x 3.29" W x 2.50" H.
Donner Robe Hook, Series: Wembley, Traditional, 2.28 in Diameter, 2.64 in Width, 30 lb, 2.24 in Projection, 2 Hooks, Wall Mounting, Die Cast Zinc, Spot Resist Brushed Nickel, Includes: Template and Mounting Hardware, For Living Bath Accessories Donner Robe Hook, Series: Ellsworth, Traditional, 3.09 in Height, 2.01 in Width, 30 lb, 3.14 in Projection, 1 Hooks, Wall Mounting, Die Cast Zinc, Mediterranean Bronze, Includes: Template and Mounting Hardware, For Living Bath Accessories View box package.